Captain James Scott Simmons was born on 10 Jan 1794 in Clifton, Truro Township, Colchester, Nova Scotia . He became a master mariner, sailing to and from his home port of Truro. At Indian Village, a port on Indian Island just off the coast of Eastport, Maine. He made friends with a merchant shipper named Joshua Edwards Freeman, and frequently visited Freeman at his home in Maine. This was how, in 1815, he met Freeman’s sister, Mercy Ann, who had moved from New York to live with her brother after the death of her father. Tradition was that it was love at first sight, and they were married 10 Oct 1816, at Truro. They settled there, near the home of James’ parents, John and Susan Simmonds. Captain Simmonds continued to sail in and out of Truro. Just shy of their first anniversary, and weeks before the birth of their only child, Captain Simmonds and his wife Mercy at tended a local barn raising. 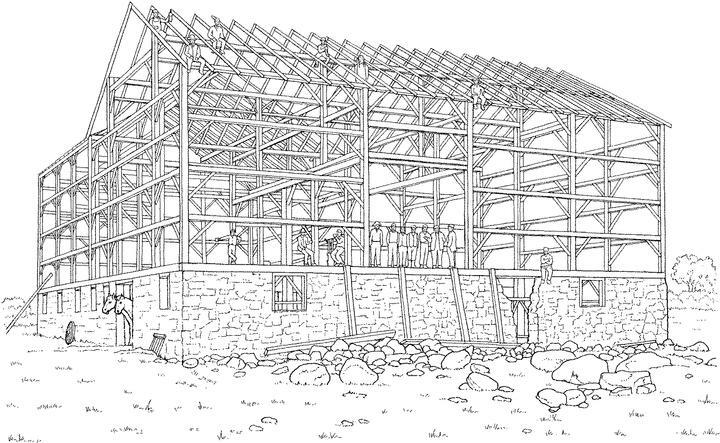 There were all manner of festivities and food along with the heavy work of hoisting the timbers to create the framework of the barn. Just before supper was served, however, one of the timbers slipped and fell, striking Captain Simmonds and killing him instantly. His wife went into serious shock from grief, and her in-laws took her to their home to recover. Following the birth of her son, William Henry, just a few weeks later, at their home, she remained ill for several months. The grandparents were certain that she would never fully recover, and would insist on taking the baby with her back to her mother’s home in New York, and somehow were able to convince the Mercy that her baby had not survived. When Mercy had recovered enough, as expected, she packed her things and returned to New York, where she became a seamstress and eventually remarried and moved West. About this time, a young man by the name of Freeman applied for work at William’s shipyard. During this conversation, William remarked that his mother’s maiden name had been Mercy Ann Freeman, but she had died in Nova Scotia soon after his birth, following his father’s accidental death. The young man remarked at the coincidence – he had an aunt whose name was also Mercy Ann Freeman, who had married a sea captain named Simmonds in Nova Scotia who had been killed in an accident, and her baby boy had died soon after during childbirth. The thought that this could possibly be his mother haunted William all night, and the next day he convinced the young man to take him to La Grange, Ohio, near Cleveland, where she was said to be living. When the two men stepped into “Aunt Mercy”s home, she was so shocked at the sight that she fainted away – evidently William had grown up to be the exact likeness of his father, and for a moment she had thought the grave had given up its dead. Overjoyed at reuniting with his mother, William returned to Augusta, left his shipbuilding business, packed the family and returned to Ohio, where he bought a farm adjoining his mother’s home, where he spent many years making up for their lost past. Frank William Simmonds, John & Susan Simmonds : and some of their descendants, with related ancestral lines (Rutland, Vermont: Tuttle Publishing Co, 1940). Available digitally at HeritageQuest. What a wonderful ending to a tragic story! It is always the best to find more than just names and dates. What a wonderful story! And what a find! Wow, what a story! Of course, now I'm wondering what happened to Mercy Ann. I’ve awarded you the One Lovely Blog Award! Please visit my blog at http://thefacesofmyfamily.blogspot.com/ to pick up your award! Wow, Tami, what a story! I cannot imagine going thru life thinking that your mom/son died, then finding each other much later in life! I too, am wondering now what happened to Mercy Ann!?! As far as I know, Mercy Ann was fortunate to spend most of the rest of her life, it seems, with her long lost son as her neighbor. Quite the happy ending. Dear Tami–William Henry Simmonds is my 2nd great grandfather. A third cousin, with whom I recently became acquainted, pointed me to your blog. I'm amazed and very, very grateful for this story. I had remarked to my cousin only a couple of weeks ago, “I wonder what is the story behind his father's death after only a year of marriage, and did Mercy Ann ever remarry? Thanks so much for your work. I've become a fan! By the way, do we know anything of Mercy Ann's life after her remarriage? I would recommend reading the sections on John & Susan Simmonds and their descendants from the book I mentioned (Frank William Simmonds, John & Susan Simmonds : and some of their descendants, with related ancestral lines (Rutland, Vermont: Tuttle Publishing Co, 1940). Yes, they eventually homesteaded in Kansas near Cedar Kansas. 200 acres that was farmed by William Henry's Son Angus Simmonds and later by his son Roy Simmonds, brother to Frank Simmonds. Burried in the Cedar cemetary with 5 other generations.